Starting in 2019, it could cost more to take the Dulles Toll Road. The Metropolitan Washington Airports Authority will be briefed on a plan to increase the tolls on the road. 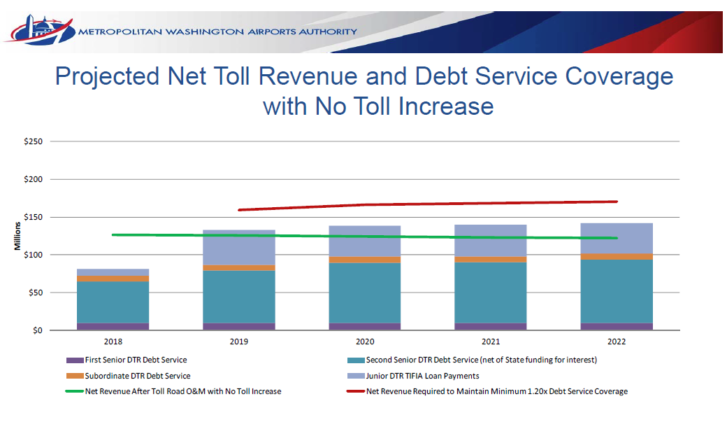 The debt coverage forecast for the Dulles Toll Road without the rate increase. WASHINGTON — Dulles Toll Road rates will likely rise next year for the first time since 2014. Previous rough estimates from the Metropolitan Washington Airports Authority called for rates to increase to $1.50 at each ramp and $3.25 at the mainline toll plaza starting around 2019. Currently, it costs $1 at ramps and $2.50 at the mainline toll plaza, although rates for vehicles with more than two axles are higher. The airports authority board, which is responsible for the road, is due to be briefed Wednesday on the toll increase plan. Public hearings on the proposed toll increases would be held this summer, likely in July and August. A vote this fall could set rates not just for 2019, but also for future years. A new tolling system that is being installed in the next few months would also allow variable toll pricing, although that has not yet been suggested. The previous estimates projected an increase from approximately $4.75 per trip to $6 per trip around 2023, $7.25 around 2028, $8.75 around 2033, $10 around 2038 and $11.25 around 2043. Toll increases could be implemented as early as January 2019. The toll road, originally built by Virginia next to the federally constructed Dulles Access Road, was transferred to the airports authority in 2008. The tolls have helped fund the construction of the Silver Line by the authority, which has driven some of the toll increases over the past decade. Tolls had been less than a dollar for a trip that included one ramp and the mainline toll plaza for the first two decades of the toll road before an increase to $1.25 in 2005. Tolls increased to $1.75 in 2010 and to $2 in 2011. Rates rose to $2.25 in 2012, $2.75 in 2013 and $2.50 in 2014. Overall, tolls are expected to cover $2.8 billion of the $5.7 billion total cost of the Silver Line, including both the first phase that opened in 2014 and the second phase that is now expected to open by 2020. Without a toll rate increase, the airports authority projects toll revenue would fall below its target minimum to cover debt service. The increase would be expected to raise toll revenue remaining after road operations and maintenance costs from around $125 million per year to around $160 million. About 59 percent of trips are taken by drivers who use a toll road ramp and pass through the mainline plaza. About 20 percent of trips use two ramps without the mainline plaza, 9 percent of trips take a single ramp and more than 11 percent pass through the mainline toll plaza on a trip that uses the Dulles Greenway. The privately-operated Greenway charges two-axle vehicles $5.65 at rush hour and $4.65 at other times. Users who enter the Toll Road pay an additional $1 ramp charge to the airports authority.